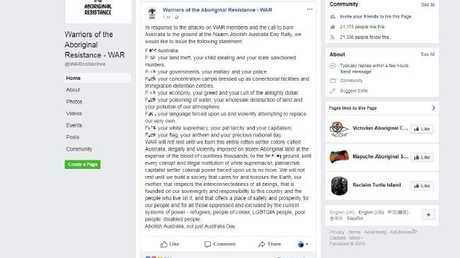 PROTEST group Warriors of the Aboriginal Resistance (WAR) has released an expletive laden statement after backlash to comments from one of its members on Australia Day. 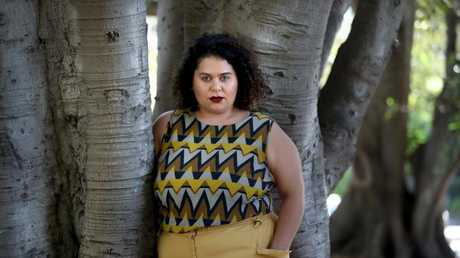 Tarneen Onus-Williams told a crowd of thousands "F**k Australia, hope it burns to the ground" during an Invasion Day rally in Melbourne on Friday. The 24-year-old also told the crowd she wanted Australia Day abolished instead of the date being changed. "All you fellas in your Australian flags should be ashamed of yourselves," she added. There were calls for the WAR organiser to be removed from her role with a government-funded body following the comments. Today, WAR, a group with more than 21,000 followers on Facebook has released a strongly worded statement in response to the criticism. "WAR will not rest until we burn this entire rotten settler colony called Australia, illegally and violently imposed on stolen Aboriginal land at the expense of the blood of countless thousands, to the f***ing ground, until every corrupt and illegal institution of white supremacist, patriarchal, capitalist settler colonial power forced upon us is no more," it read. Warriors of the Aboriginal Resistance’s (WAR) statement on Facebook. Source: Facebook. Former Victorian premier Jeff Kennett toldThe Australianthat Ms Onus-Williams, should step down as an executive member of Victoria's Koorie Youth Council (KYC) for a series of angry, divisive comments. "I don't think it's appropriate that she continues to serve on the council," Mr Kennett said. "This is something that's meant to advance the understanding and appreciation of all things indigenous and in saying what she has, she's shown that she's totally incompatible with that. I think it's a case of 'thank you, but goodbye,'" he said. KYC released a statement yesterday saying Ms Onus-Williams is a "volunteer youth member" with the organisation. "Ms Onus-Williams's role in Friday's rally is separate to her volunteering at KYC," the statement read. "As on organisation, KYC does not share her stance." Ms Onus-Williams told Fairfax Media late last week: "It was a strong statement, but I am not going to apologise for it. "It was a metaphor, not actually a statement to be taken literally," she added. "I just want everything, all the governments to fall apart, because our people are dying and nobody cares and the whole system needs to change. "The leaders of this country continue to ignore and oppress us. I am sick of our people getting locked up and dying in custody, of our young people suiciding. "I don't have all the answers of what is going to liberate us. I just know the current system isn't working. Since colonisation nothing has worked for blackfellas on this land." "Sometimes, when you're a bit poetic, things get taken out of context," she added on Twitter. However, indigenous leader and former ALP president Warren Mundine has also put pressure on Ms Onus-Williams after her remarks. Mr Mundine said she was a hypocrite and a "hater" for working with the government on state-funded programs while openly attacking the government and causing division in other forums. "The serious question here is why is the government funding these groups and these organisations when the people involved are haters who have no scruples about taking taxpayers' money and then spitting in their faces," Mr Mundine told The Australian. "And governments only have themselves to blame for wasting taxpayers' money, because there's no real rigour in appointments and no questions about where this money is going. And then you see money going into causes and demonstrations where people are racially abusing and threatening people - it has to change." However, some on social media came to the defence of Ms Onus-Williams. "I am furious and ashamed at how people have targeted @Tarneen and the Koori Youth Council. This is modern day colonisation," wrote one commentator. "When people threaten and try to silence strong black voices by vandalising centres and threatening women - what else could it be called." News.com.au tried to contact Ms Onus-Williams via the Warriors of the Aboriginal Resistance. However, the organisation refused to comment on the criticism.